At least 80 % of traffic to a typical website emanates from Search Engines. Depending upon the type of content in the website, most of the traffic comes from leading Search Engines like Google and Yahoo amongst others. If you are catering to a niche segment, your traffic might depend on individual indexes/directories. Ranking higher on organic search results is essential for the success of any website. With today's unprecedented penetration of the Internet reach across a wide range of population all over the world, it is imperative that Search Engine marketing is treated with the utmost importance it deserves. * Interestingly there are about 10 million internet users in India and about 60 million internet users in China - the world's two most populous countries as per statistics gleaned from several of their ISPs. "Well-researched contents - sheathed in powerful words to the accompaniment of optimized graphics and layered in the right choice of technology"
will eventually get you the top Rank. 2. Optimization : Human visitors seek content in many forms - actual content in the form of text supplanted with graphical information inputs and in the process interact with dynamic contents. On the other hand, robots or spiders sent out to crawl your pages have limited 'intelligence' to supply information in order to interact with some of your dynamic pages. They can't extract indexable information from your graphics. Thus it is imperative that you divulge indexable information for the benefit of the robots in your pages. Optimization of dynamic pages is dealt in more detail here. a. General optimization : You optimize contents for the robots which are transparent to the normal human visitors. Using deprecated techniques like 'cloaking' might eventually lead your site to be banned by the Search Engines. b. Optimizing for Keywords /Keyphrases : Search Engines always are in a state of evolution. Technology is evolving to meet the ultimate objective of providing 'sensible search results'. The algorithm of sifting through the vast trove of information, extracting the key information and presenting the 'correct' information depending upon the Searched term is complex and almost always a closely guarded secret. Page ranking algorithm always change to weed out spams and dubious means. It is prudent to research for the most popular keyword or keyphrases and optimize your page, incorporating sufficient content laced with the target keywords and keyphrases. Getting good Page Ranking for a keyphrase in consonance with the theme of your page content can be accomplished easily enough by this means. c. Build links : This painstaking process of building incoming links over a period of time enhances your Page Rank to a great extent. But it depends on the 'quality' of the incoming links. If you get a link from a leading Script repository like Hotscripts.com and you are selling scripts from your site, it will carry much higher points than from a personal website. So spend time to build quality incoming links. What we have outlined above merely touches on the various aspects of Search Engine Optimization in a brief manner. 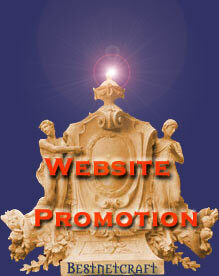 We would be delighted to offer detailed help as part of our services in Bestnetcraft - to promote your website.